For this post I thought I would address a topic that has arisen in numerous lessons of late with my own students and something that I feel needs addressing. This topic is the importance of developing a good musical ear through transcribing songs. I often have students ask me if they can learn to play their favourite song (which is definitely something I strongly encourage) but they often look back at me horrified when I ask if they have tried working it out themselves. It seems this idea had never crossed their minds! Go back a few years, though, and working out songs by ear was the primary means of learning to play the guitar. This is how most of our guitar heroes and legends taught themselves how to play. You read over and over again in interviews how they would sit with a vinyl record and play it repeatedly in order to learn the guitar parts they admired. Nowadays Internet tab and artist song books are a student’s first port of call but you can only get so much from a tab. If you want to get the true feel and tone of an artist you have to use your ears. Perhaps even more important is that you will learn to hear parts that aren’t always written out in transcription. There’s nothing stopping you from playing the saxophone part from a song like, for example, “Take Five” except, perhaps, your current lack of confidence in your listening skills. 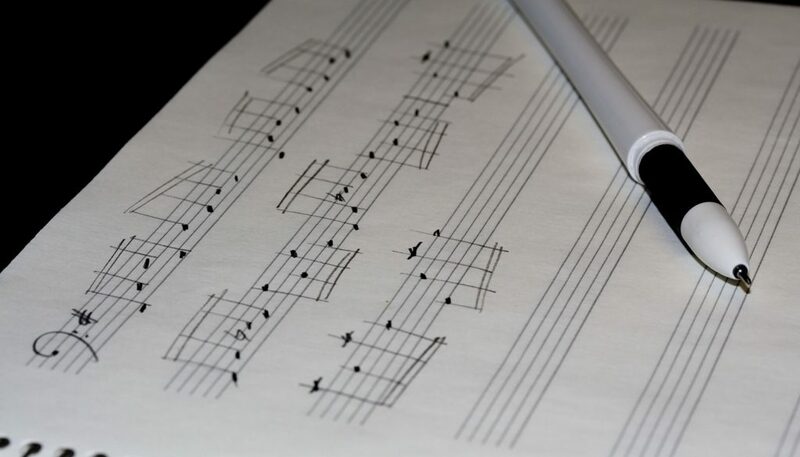 Transcribing, technically, is writing out a song so that another person (yourself included) can play it from your written notes. But because transcribing is becoming such a rare ability we tend to think of it these days as the art of working out songs through using your ears and also writing it down. But for now we are only looking at working it out at this stage. It is important to note, though, that there are different levels of transcription. You could be doing something as simple as figuring out the time signature and the chords of a song so that you can strum along to it. Or you could be trying to work out a note-per-note transcription of a single guitar part. Or you could be working all note-per-note transcriptions of all the guitar parts of a single song. Since we’re just getting started, let’s focus on figuring out the chord progressions, okay? So when do I start trying to transcribe? As soon as possible, obviously this seems daunting to the beginner guitarist but developing a good musical ear is all about experience, so just give it a try but most importantly keep trying! Start with your favourite song and try to clap along with it, is it 4/4 time? Listen closely to the Bass guitar which often plays the root notes of the guitar chords, try to pick them out along the “˜E’ string and change chords with the guitar. As mentioned, definitely take your time with the last lesson, which goes through figuring out three song examples step by step. And don’t forget that most people who teach have been working songs out by ear for quite a while so don’t be discouraged if it doesn’t come to you magically in an instance. Like everything about the guitar (and music), transcription takes practice. But at least now you’ve got something to go on in order to start practicing. The song is too fast, I can’t keep up. And, unlike your guitar heroes, you’ve also got a lot of help! There are many computer programs available such as Transcribe! and Amazing Slow Downer which allow you to slow down, loop sections and change the pitch of audio tracks. Plus the digital players in some computers also provide such assistance. So now you have an idea of where to start it is time to begin. Have a go at transcribing one or more of the four songs below, in this case “transcribing” meaning “work out the chord progressions, just as David did in “Solving the Puzzle. To give you a hand, all the songs in question use some or all of the chords G, D, A, C, Em, and B7. All you have to do is work out which ones and in what order. And don’t be shy about attempting songs not on the list! The more you practice on the better you’ll get at working out songs by ear. I shall return in a few weeks with the answers but until then good luck and happy listening. P.S. Extra credit marks for working out the guitar solos! “Transcribing – Part 1” first appeared in Volume 4 # 10 of Guitar Noise News. Sign-up for our newsletter to receive more free tips like this by email.